As we enter the new year, we should reflect on the curse that has been brought on our nation this past year. In an already bitterly-divided America bogged down by polarization & gridlock, 2017 introduced a presidential component serving to exasperate & deepen these disturbing patterns/trends. We have put in place a leader of these United States (or formerly united) who is a chronic liar, temperamentally & emotionally unstable, a thin-skinned bully, narcissistic, egomaniacal, sexually abusive, racist, bigoted, sexist, xenophobic, always sowing conflict & discord, with not an ounce of ability to see outside of himself to empathize with others. A person of such badly-flawed ethical character does not possess the personal traits or moral authority to lead. And rather than draining the swamp, Trump is stocking it with more snakes & alligators. Our democracy is on the line. America could fall victim to the same type of despot autocratic rulership our country always took the international lead in opposing. Our divider-in-chief is up to his old tricks again, attacking the integrity of the investigations with all manner of lies, distortions & diversions. As revealed in the related articles below from this past week, Trump & many in his sphere are acting guilty as hell with their obvious pattern of obfuscation, including some members of Congress & the messaging echo (see part 2). Their latest gambits include smearing & orchestrating reassignments of FBI agents, like those who can corroborate Comey’s account that Trump had demanded a loyalty oath from him as FBI Director & attempted to meddle in his investigation. There’s also a new strategy to paint Michael Flynn as a total liar, which indicates they know Flynn is spilling the beans & he must know some real dirt on Trump’s coordinating the campaign’s wink-wink deal with Russia. The Trump camp has been fighting the Russia investigations all along rather than helping get at the truth, which it’s abundantly obvious they have something very serious to hide. And as the Mueller investigation widens, it’s also become obvious the scandal is reaching a wider circle, with likely several dozen in Trump’s circle in legal jeopardy as the pieces to the puzzle are being put in place. It will be fascinating to watch 2018 play out as to how far-reaching this probe really becomes, as it’s clear Trump has teamed up with some of the most radicalized nudniks in Congress & echo to fight against the facts coming out. Reps Nunes & Rohrabacher, plus Fox’s Hannity & Judge Jeanine, appear to be integral parts in helping craft the messaging for deflecting the collusion narrative & aiding in the cover-up. Others in Congress like Jordan, Gaetz & DeSantis have joined in on the all-out assault against the truth & democracy, directly attacking the FBI while also directly or indirectly smearing the Mueller investigation, all to protect their demagogue president. And Louie Gomer Pyle remains the most intellectually-challenged member of Congress. There’s even this deranged moron, Rep. looney-Rooney, calling for the purging of the FBI, sounding very much like as part of Trump’s group of thuggish henchmen, they desire orchestrating a coup against our longstanding democratic institutions. If Trump & his campaign were innocent, they could let the Mueller campaign run its course & actually assist him in uncovering the truth, so the prez could be exonerated. Instead, there is all this plotting, diversionary tactics, covering-up, subterfuge, & scheming whatever nefarious strategies they can dream up in their unrelenting attempts to undermine the investigations & laws of the land. Others such as Andrew McCabe are also being unfairly attacked by the Trump mob with vicious, disingenuous & inaccurate innuendos to disparage his testimony. McCabe is a chief corroborating witness to the criminal act of obstruction of justice committed by the President of the United States with that loyalty pledge he demanded of Comey. It’s also blatantly obvious with Trump & his minions also attacking the likes of Flynn, Papadopoulos, Sessions & their favorite punching bag Hillary again, it’s all part of a coordinated strategy to discredit whatever the investigations are soon to reveal. The nuttiest part is how their nutty base is buying in. They’ve been brainwashed to dismiss whatever Mueller finds while also instructed to disregard the contents of the now-famous dossier. But Mueller must be onto some really juicy evidence since the Trump-machine is ratcheting up their crazy conspiracy theories & smear tactics to higher levels than we’ve yet seen. They even trotted out Ken Starr to join in the Mueller-is-biased deceptions, when ironically Starr was far more biased in investigating President Bill Clinton than Mueller ever was. So we may be hearing something big coming from the Mueller probe soon based on the level of alarm coming from team-Trump. This year I’d been predicting by now enough damaging evidence would have been made public about Trump to force his resignation. But the Mueller team is very tight-lipped about leaking & I’m fairly certain what they know about Trump’s involvement goes way way way beyond what we know from media reports so far, which when we do finally find out will likely prove shocking to our nation. Mueller understands the hyper-partisanship currently gripping America, plus the fervent deception-machine represented by Trump, his surrogates, echo-cheerleaders & Trumpeter base, to where he must sell his case from a political & not just legal standpoint. So he’s holding his cards close to his vest until the complete case can be made that’s comprehensive, concrete & irrefutable, which finally lowering the boom could come about at any given time in 2018. With all the preposterous allegations coming out about Mueller from partisan political pundits duping the GOP base, Mueller knows full well the level of proof must far surpass the Watergate evidence to get a GOP Congress to buy in on impeachment. But reading between the lines how this scandal is playing out, I sense when it’s all said & done, Mueller’s report will ultimately prove jaw-dropping as to the level of widespread criminal activity that was done. When that does happen, it will shake our nation to its core, but the purging will serve as a vital cleansing for America. The big truth is that to the degree that there was bias in the FBI before the 2016 election, that bias was in favor of Trump, and demonstrated by Comey’s intervention in the final days of the campaign. The real fake news is for any Republican to suggest that prior to the election the FBI was biased against Trump, when in fact the actions of the FBI director before the election, taken for whatever reason, helped elect Trump. America stands on the precipice of a great constitutional crisis. Every Republican should join every Democrat in and take a stand of conscience and patriotism at a critical moment in American history—and warn the president to not cross a red line that would be a disaster for his presidency and our country. Whether Trump fires Mueller or not, he is likely to face impeachment — the only way he can avoid it is if Mueller exonerates him, which is unlikely. Getting the articles of impeachment through a Democratic-controlled House wouldn’t be a problem. Peeling off enough GOP senators to convict (67 votes needed) appears unlikely, but at least a few Republicans might abandon the president if Mueller finds unequivocal proof of collusion between Trump and Russian President Vladimir Putin — or if Trump fires Mueller. 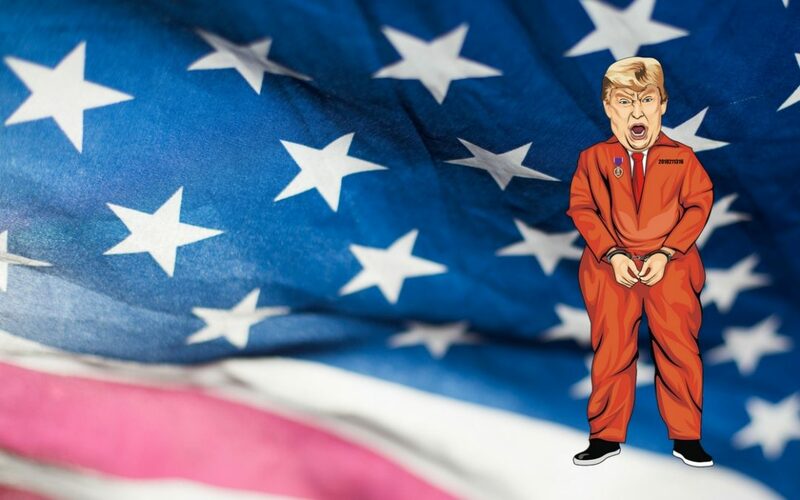 If an impeachment trial does occur in 2019, it would unleash a political war that for sheer nastiness would easily surpass the struggles over Richard Nixon’s and Bill Clinton’s impeachments. Trump has fewer compunctions than either Nixon or Clinton about using every tool at his disposal to stay in office, and with Fox News, Breitbart, Infowars, and other propaganda outlets at his beck and call, he has a way to bypass the mainstream media to mobilize his rabid followers. Street violence is not out of the question. What’s truly worrisome is that Trump might try to save his own skin by launching either an actual war or a trade war in a Wag the Dog ploy. Fasten your seat belts. We survived Year One. But Year Two of the Trump presidency promises to be an even bumpier ride, with catastrophe looming around every corner. Dent said that Trump was “a factor” in his decision to retire from Congress after the end of his term next year and assessed the state of the country as “paralyzed” by polarity. “The polarization has reached the point of paralysis. There doesn’t seem to be the bipartisan collaboration up front that we need on a lot of big issues,” he said. Dent — a moderate who has been an advocate of bipartisan solutions — declared that Washington, D.C. is “worse off” than when he arrived in the nation’s capital in 2005. “When you look at some of the audiences cheering for Republicans, sometimes, you look out there and you say, ‘those are the spasms of a dying party,’ ” Flake said on ABC’s “This Week.” “When you look at the lack of diversity, sometimes, and it depends on where you are, obviously, but by and large, we’re appealing to older white men and there are just a limited number of them, and anger and resentment are not a governing philosophy,” he continued. Beneath other links on Trump’s sinking approval ratings which could open the door for Dems sweeping elections for the foreseeable future, we also see links about an editorial from the Salt Lake City Tribune, making it very clear Sen. Orrin Hatch has lost his fastball, so Utah & America would be far better served with Romney in the Senate. So take your pick from numerous links below on the most relevant recent articles. There’s only one set of messages from me this week with the holidays, but still with 3 separate parts. There’s always part 1 on Trump-Russia, part 2 on the echo & part 3 on the economy. But the scandal feels like a pressure-cooker where the lid could blow off at any time. Stay tuned. Lots of fireworks are coming for 2018. Even if the echo-crowd were to peruse the link titles & just pick 1 or 2 to click on & read, it could go a long way in exposing them to a different point of view. I send these out not that I agree with all their opinions, but to help counter the even more extremist rightwing echo. I sure hope Cubs fan & other echo-fans are paying attention, since amidst all this leftist propaganda are some viewpoints which are soon to be revealed as verifiably factual. Just wait & see.